In her work, Hanane El Farissi tackles problematic related to memory and the construction of the individual, by making her body the central element of her artistic practice. The exhibition currently presented at Le Cube – independent art room consists of the projects initiated by the artist during the summer’s lab. During this program, Hanane El Farissi has developed a research that serves to recreate her own memory by redrawing and appropriating her father’s story. 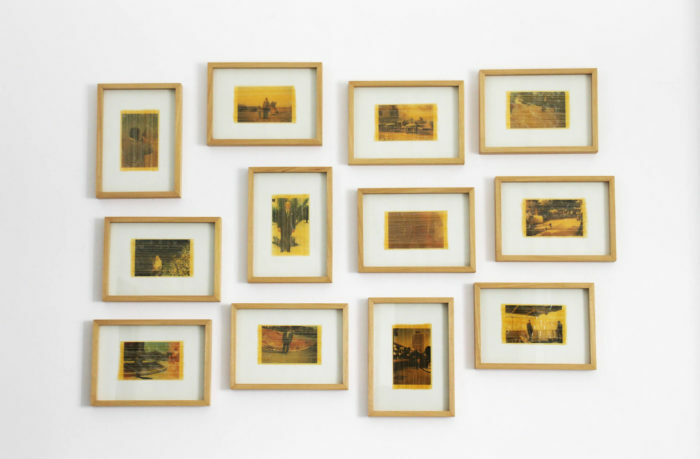 For that matter she collects photographs and testimonies of her family members and assembles those collected elements as the pieces of a puzzle whose pattern gradually appears. Like a glaze that consists of coating a transparent painted canvas forming a veil and giving vibrancy to the image, Hanane El Farissi covers twelve photographs of her father with tape. 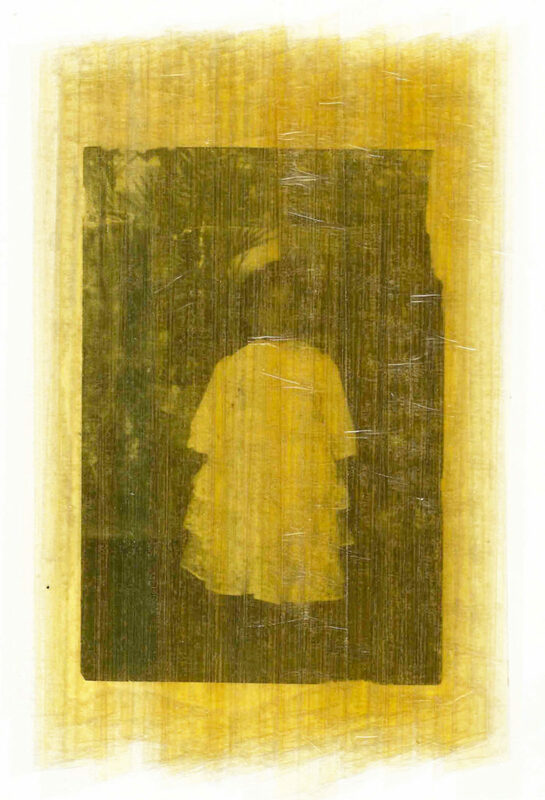 This not only makes the paper untearable and prevents color degradation by light, but also produces new images: nebulous and uncertain, such like those that haunt the vestiges of our memories. Hanging on the wall like family pictures, this series forms a rhizomatic whole, without beginning or end, allowing the emergence of an infinity of readings and stories. 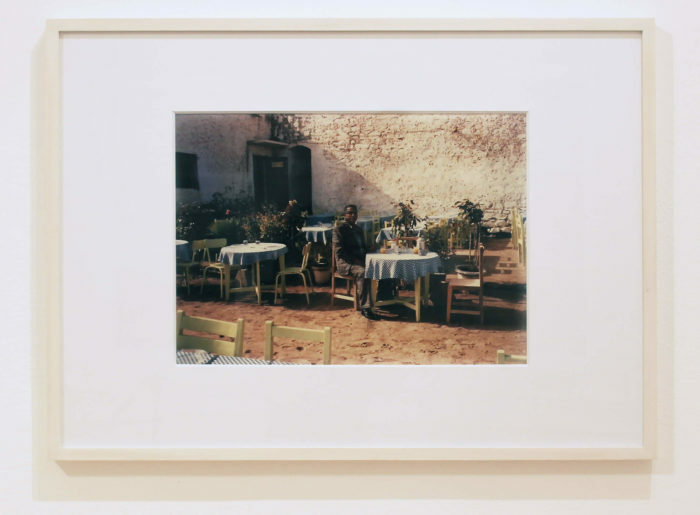 One of her works is about a family photograph that she modifies in order to question its meaning and content. In fact, Hanane El Farissi alters an image by embroidering her hair on it. By this gesture that wrappes the body of her father, she marks her desire to seize the reminiscences of her ascendant in order to build her own memory. In the installation presented in room 2, Hanane El Farissi lists a series of Arabic terms, synonymous with the word memory. She transcribes them by sewing her hair on paper. Hair is the last bodily human substance to decompose after death and functions as a recorder through which we are able to determine several components of a person’s life. Thus, with this gesture, the artist weaves links between memory and her own identity. Discreetly placed in a niche of Le Cube – independent art room, a third installation uses hair as artistic material. This little sculpture functions like a self-portrait, an allegory of the artist’s memory. All the hair in the previous artworks is woven, straightened and ordered, but in this installation, it forms a fierce set whose shape varies with time, like memory. In a separate room, Hanane El Farissi presents another work and deepens her research. Images, objects, books, and notes function as a collection of sediments that form different states of memory. Also, the voice of the artist reciting the synonyms of the word memory in Arabic resonates in the space, and echoes the installation located in the next room.